How financially strong is your invoice finance company? The recent appointment of Liquidators at Urica Ltd made me think about the relative strength of the financial position of different invoice finance companies. In the case of Urica, they had incurred significant historic losses, and had a negative net worth within the business, according to accounts filed prior to the failure. Therefore, they are likely to have been very vulnerable to negative events, such as customer fraud. Many of the invoice finance companies are backed by heavyweight investors, or large concerns, hence they are likely to be able to survive even if they took a significant loss. However, even investors with the deepest pockets, could end up deciding that “enough is enough”, when a business suffers a significant bad debt through customer fraud, particularly after having incurred significant start-up losses already. There are other examples of funders in a similar position within the invoice finance industry. Companies that have incurred significant losses, but are supported by investors with deep pockets. However their ability to survive a large bad debt may not have yet been tested. There are other companies who are in a much stronger financial position. Many of the large invoice finance companies are backed by either High Street banks or significant independent groups. 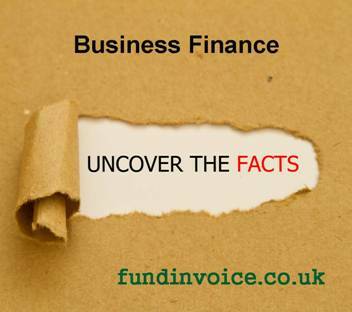 In the case of an invoice finance facility, you might argue that once you have received the funding, the financial state of the provider does not matter. However, there is an ongoing rolling nature to an invoice finance facility, that is not similar to say a loan. In the case of a loan, once the capital has been provided, the failure of the financier may not have such a large effect on the borrower. However, with invoice finance there are a number of complications. Firstly, the funding can be of an ongoing, revolving nature. This means that as new invoices are raised so new funding is released, as old invoices are paid so old funding is repaid. The issue with failure of a funder occurs if it is at a point where your ledger is such that significant debt has just been paid, reducing your funding position such that you may not have drawn your full availability. In that situation, if the finance company is no longer trading, you may not be able to draw the remaining available funds. The other complication to the failure of an invoice financier would be the peripheral services that are provided. In the case of a factoring facility, it includes the provision of a credit control service. This means that should the company fail they will no longer be undertaking the collection of your sales invoices, which could have a disastrous effect on your sales ledger. There may also be other services, such as payroll, that may be offered by the provider. Once again, these could cease after failure of the funder. In some cases, it is very difficult to find a provider that will offer an invoice finance facility to some customers. We have dealt with cases where we have searched the market and found just one finance company that will offer a facility to a particular customer. In these situations, the customer may take a view that they cannot afford to be choosy about the financial position of the invoice finance company. It may be more a case of having to accept the contingent risk that the funder may fail in order to access the financing is required. However, in the more usual course of business, it would seem wise to look at the financial situation of an invoice finance company in order to minimise the possibility that the company could collapse due to a bad debt, or similar trading downtown. If you require help with this, we are able to direct you towards invoice finance companies that are supported by large backers, in addition to being able to scour the market to find funders that can handle any particular customer situation. For assistance please call Sean on 0333 0 11 3622.